It’s happening: WHO RIDES THE WORLD starts NOW! This month Riser is dedicating their support to women motorcyclists around the globe! With our initiative WHO RIDES THE WORLD we will be highlighting female riders, female clubs, female festivals and other great initiatives by women who all share passion for motorcycles. But we also want to involve YOU: we want the whole community to participate and you will have the chance to WIN! (read here for more info). Make sure to stay tuned over the course of the next weeks and let’s kick it off with The Break Fast Club from Vienna! The Break Fast Club is a group of women gathered around the passion for motorcycles. A family founded in 2017 as a result of many breakfasts and numerous rides together since many years. They are RISER AMBASSADORS and support with us the female riders movement. 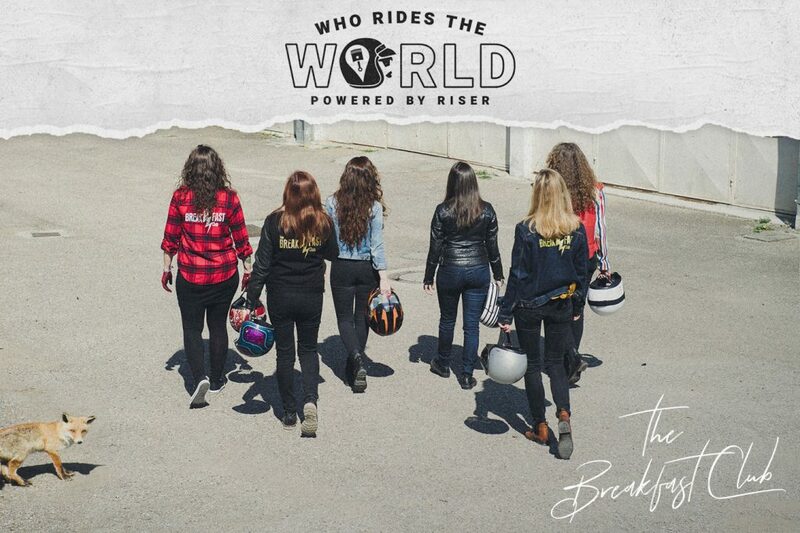 This year The Break Fast Club is taking part in WRWR – Women Riders World Relay, an initiative organised by women for women, all around the globe. Read further for more news about the Break Fast Club at the WRWR – 2019 Austria! The all female Break Fast Club have a powerful set of values. They stand for sharing, empowering, learning and leading a change in how we view female motorcycle riders. The Break Fast Club is an open platform for women to share their passion and express themselves on specific topics about their motorcycle experience from the female point of view. Their aim is to make women more visible in the motorcycle world and support female riders from all sides, whether it’s customizing your bike in the garage or passing your motorcycle driving license. This year the Break Fast Club is taking part in the WRWR – Women Riders World Relay, riding with the baton from Weigetschlag in Austria to Vaduz, Lichtenstein in only 3 days. The Women’s Riders World Relay is the initiative of Haley Bell, a 27 year old rider from the UK with the vision to be the global “eye-openers” for women in motorsports. Women around the world have brought their forces together and worked for months to map out routes and locations and developed the whole relay, covering even the most remote parts of the world. The relay has already started in Scotland in February 2019 and has stretched through France, Spain, Portugal, Andorra, Slovenia and more. The relay will be arriving to Austria on the 16th of April where the Break Fast Club will join in for three days. Liz became a motorcycle enthusiast 3 years ago. Community, family and harmony are the core values of the young lady, who is always on the road with her Yamaha XSR 700. In love with speed and curves, she is the big sister of the BFC, connecting passion and friendships on wheels. Patricia started with dirt bike and off-road races, surrounded by a family of motorcyclists. She is an insatiable all-rounder between woods and asphalt with her old-timers, an outstanding R&D project manager in sport technology at the University of Applied Science in Vienna and the happy mother of a one-year-old boy. Susu has evolved in the motorcycle world from a young age. Starting with an Italian Guzzi and always pushing herself and her bike to the limits, she then fell in love with the BMW R nineT. Susu is not only working for a garden company, but is also the flower of the BFC, supporting women’s blossom in the motorcycle community and helping them find their own way and style. Jenna is fueled by gasoline blood and love for life. In 2017, she traveled on her motorcycle for 30.000 km through Europe and then founded her atelier À-moto to combine her passion for motorcycle and art. Jenna is not only part of the BFC founder team but also a crew member of the Moto Circle Festival. Starting on April 16th, 2019 in Weigetschlag, Austria the TBFC will take off with the baton at 8:00 AM. Covering approximately 280 km in one day they will arrive in Bischofshofen before dark. The route will include highlights such as Hallstadt and Traunsee, a perfect scenery for some photo documentation. The next day will cover an even longer distance, a 360 km stretch from Bischofshofen to Bludenz. Stops include Mittersill Alps Panorama and Krimml Waterfalls. The final destination for the group will then be reached on April 18th in Vaduz, Liechtenstein where they pass on the baton to the next group to be taken onto the rest of the world. RISER gives you 2 months of RISER PRO for free so you can easily participate, ride together and share your Pack Rides on your Social Media to support female riders: Activate your 2 months PRO until May 15thby clicking this link (set up a free account first) https://wg9mw.app.goo.gl/whoridestheworld .